(1946, Moscow, today RU) studied at a music school. From 1963 member of Dviženije. He worked as a designer for Soviet organizations. (1936, Vietri sul Mare, IT) is a ceramicist and self-taught artist. 1963 moved to the United States and lived in New York. 1968 moved to Milan. Since 1969 he lives in Florence, IT. (1910, Jelsa, today HR – 1997, Zagreb, HR) studied art history at the University of Zagreb (grad. 1935, Ph.D. 1951). 1960–1972 professor in the department of art history in Zagreb. Co-founder of the Institute of Art History in Zagreb. Lit. : G. G., Tizianov poliptih u katedrali u Dubrovniku, Zagreb, 1955. G. G., Stari majstori u Jugoslaviji, Zagreb, 1961. G. G. and Ivan Čizmek, Oskar Herman, exhib. cat., Galerija suvremene umjetnosti, Zagreb, 1966. (1930, Buenos Aires, AR), 1960 founding member of the Centre de Recherche d’Art Visuel, but not active in the Groupe de Recherche d’Art Visuel (GRAV). He lives in Paris, FR. Exhib. : 1960, motus, Galleria Azimut, Milan. (1929, Buenos Aires, AR – 2012, Paris, FR) studied at the Escuela Nacional de Bellas Artes Prilidiano Pueyrredón, Buenos Aires (1950–1957). 1960 founding member of the Centre de Recherche d’Art Visuel. 1961 founding member of the Groupe de Recherche d’Art Visuel (GRAV). He lives in Paris, FR. Exhib. : 1964, documenta 3, Kassel. 1965, The Responsive Eye, The Museum of Modern Art, New York. See also: Groupe de Recherche d’Art Visuel. Lit. : See: Groupe de Recherche d’Art Visuel. ([–]) studied humanities and fine arts at the State University of New York at Buffalo (M.A. 1971 and M.F.A. 1972). 1966–1986 he was a member of the Art Research Center (ARC). Exhib. : 1970, Art Research Center, Kansas City, MO. 1971, Arteônica – O Uso Criativo dos Meios Eletrônicos em Arte, Sao Paulo. (1930, Basel, CH) studied at the Allgemeine Gewerbeschule in Basel under Emil Ruder before a three year apprenticeship as a graphic designer. 1959 cofounder of the Agentur für Werbung, Grafik, Publizität Gerstner + Kutter, later renamed GGK (Gerstner, Gredinger + Kutter). 1970 left GGK to focus on his artistic work. He lives in Basel, CH, Hippoltskirch, and Paris, FR. Exhib. : 1960, Konkrete Kunst. 50 Jahre Entwicklung, Helmhaus, Zurich. 1964, documenta 3, Kassel. 1973, think program, The Museum of Modern Art, New York. Lit. : K. G., Kalte Kunst – zum Standpunkt der heutigen Malerei, Teufen, 1957. K. G., “Bilder machen heute,” in: Spirale, 8, 1960, pp. 3–15. K. G., Programme entwerfen, Teufen, 1964 (1963). — Samuel Y. Gibbon, Jr.
([–]) studied English literature at Princeton University, USA, and Elizabethan theater at University College, London (1953/1954). 1960–1967 writer and associate producer of CBS television programs. 1972–1982 taught at Harvard University Graduate School of Education, where he was also a producer in residence at the Center for Research in Children’s Television (1972–1982). 1981–1991 served as executive director of the Bank Street College Project in Science and Mathematics. (Gilbert Prousch, 1943, San Martin de Tor, IT, and George Passmore, 1941, Plymouth, UK) work together as a duo. Gilbert studied at the Kunstschule Wolkenstein, the Kunstschule Hallein, and the Akademie der Bildenden Künste München, Munich. George studied at the Darlington Adult Education Centre in Devon, the Dartington Hall College of Art, and the Oxford School of Art. They have collaborated since 1967. Gilbert & George live in London. Exhib. : 1972, documenta 5, Kassel. (1945, Pewsum, DE – 2003, Gelsenkirchen, DE) did an apprenticeship as a typographer and studied graphic design at the Hochschule für Gestaltung Ulm (HfG) (1965–1968). 1985–1989 teaching assignment in Dortmund. From 1989 professor at the Muthesius Kunsthochschule, Kiel, DE. Exhib. : 1967, Vom Konstruktivismus zur Kinetik. 1917 bis 1967, Galerie Denise René, Hans Mayer, Krefeld. 1968, rolf glasmeier. kaufhaus objekte, (op)art galerie h. f. mayer, Esslingen. (1939, Zurich, CH) studied law, art history, and archaelogy at the University of Zurich (1958–1961, no grad.). 1963 moved to Florence. 1970 moved to Milan. 1988–1997 lived in Ameno, IT. He now lives in Paris, FR. Exhib. : 1966, strutture organizzate, Studio di musicelettronica, Florence. 1967, Jakob Bill, Christen, Glattfelder, Müller-Brittnau, Studio d’informazione estetica, Turin. 1968, Wege und Experimente, Kunsthaus Zürich, Zurich. (1923, Madrid, ES – 2008, Buenafuente del Sistal, Guadalajara, ES) studied at Escuela Superior de Bellas Artes de San Fernando, Madrid (grad. 1951). He was professor of drawing at the Instituto de Bachillerato Laboral de Saldana. 1969–1973 participated in the seminars “Generación automática de formas plásticas” at the computer center of the University of Madrid. Exhib. : 1970, Generación automática de formas plásticas, computer center of the University of Madrid. 1971, The Computer Assisted Art, Palacio de Congresos y Exposiciones, Madrid. 1972, Venice Biennale. Lit. : J. L. G. P., “Un intento de sistematización en la creación plástica,” in: Boletín del CCUM, 8/9, January 1970, pp. 20–27. existed from 1959 to 1966. Members of this group were the painters Marijan Jevšovar, Julije Knifer, Đuro Seder, and Josip Vaništa, the sculptor Ivan Kožarić, the art historians Dimitrije Bašičević, Matko Meštrović, and Radoslav Putar, and the architect Miljenko Horvat. Exhib. : 1961–1963, Gorgona exhibitions, Studio G, Zagreb. Lit. : Gorgona (ed. ), Gorgona, Zagreb, series of journals, 1961–1966. (1934, Schilde, DE – 1983, Habkern, CH) studied economics at the University of Frankfurt (1955–1956) and painting at the Akademie der Bildenden Künste München, Munich, under Ernst Geitlinger (1956–1961). 1960 founded nota gallery with Jürgen Morschel. 1970–1972 collaboration with Rolf Wölk on serigraphs. Exhib. : 1960, Junge Maler. München – Ulm, studio f, Ulm. 1961, structures. l’art abstrait constructif des pionniers à nos jours, Galerie Denise René, Paris. 1965, The Responsive Eye, The Museum of Modern Art, New York. Lit. : Co-publisher of nota magazine (1959–1961). (1941, Vienna, AT) studied information technology at the Technische Hochschule Wien, Vienna. 1966–1970 assistant professor at the Technische Hochschule Wien. 1966–1978 member of ars intermedia. He worked as a project manager on data-processing projects for the Vienna public transportation authority, as well as for the Austrian Federal Railways (1971–1994). Since 1995 independent consultant for various international railway companies in Eastern Europe. He lives in Vienna. Exhib. and lit. : See: ars intermedia. (1937, Berlin, DE) studied painting and graphics at the Hochschule für bildende Künste Berlin and did an apprenticeship in photography and film in Berlin and Munich. He lives in Berlin. Exhib. : 1968, Generative Fotografie, Städtisches Kunsthaus, Bielefeld. 1969, Auf dem Wege zur Computergraphikk uBu, Karlsruhe. 1970, Auf dem Wege zur Computerkunst, Kongresshalle, Davos. 1975, Generative Fotografie, Internationaal Cultureel Centrum, Antwerp. Lit. : Kunst aus dem Computer, joint summer conference “The Computer in the University” / “Der Computer in der Universität,” Massachusetts Institute of Technology, Technische Universität Berlin, conference proceedings, Berlin, 1968. (1924, Vienna, AT – 2001, London, UK) studied music at the Akademie für Musik und darstellende Kunst Wien, Vienna, from 1952. 1958 commenced artistic activities. 1964 moved to Paris, FR. Exhib. : 1964, Mouvement 2, Galerie Denise René, Paris. 1965, The Responsive Eye, The Museum of Modern Art, New York. 1969, Formas computables, computer center of the University of Madrid. Lit. : L. G., internationale Sprachexperimente der 50/60er jahre / international language experiments of the 50/60ies, Frankfurt am Main, 1970. (1944, Paris, FR) studied music and philosophy at the Paris-Sorbonne University (1962–1965). 1969 1971 taught at the University of Vincennes, now University of Paris VIII. 1969 founding member of the Groupe Art et Informatique de Vincennes. was founded in 1969 at the UER Informatics, University of Vincennes, now University of Paris VIII. Founding members were Hervé Huitric, Jean-Claude Halgand, Francine and Jacques Dupré, Jacques Arveiller, and Patrick Greussay. They were joined by Jean-Claude Marquette, Monique Nahas, Pierre-Louis Neumann, and later by Michel Bret, Gilbert Dalmasso, and Louis Audoire. From 1971 publication of the magazine ArtInfo-MusInfo. Exhib. : 1971, exhib. accompanying the colloquy “Umjetnost i kompjuteri 71” / “Art and Computers 71,” Zagreb. 1972, Groupe Art et Informatique de Vincennes, Galerie Weiller, Paris. Lit. : ArtInfo-MusInfo, nos. 11–17, 1971–1973. In July 1960, Hector García Miranda, Horacio García Rossi, Hugo Rodolfo Demarco, Julio Le Parc, Vera and Francois Molnár, Francois Morellet, Sergio Moyano, Servanes (Simone Revoil), JoeÅNl Stein, Francisco Sobrino, and Yvaral (Jean-Pierre Vasarely) founded the Centre de Recherche d’Art Visuel, a center for visual research where the artists could work together towards the realization of their common formal and theoretical goals. In the summer of 1960, the young artists rented a small garage in the Marais district of Paris, which provided them with a common meeting and exhibition space. The center was renamed Groupe de Recherche d’Art Visuel (GRAV) in July 1961. From then on, the group members were García Rossi, Le Parc, Morellet, Sobrino, Stein, and Yvaral. The group disbanded in November 1968. Exhib. : 1961, Proposition sur le mouvement. Groupe de recherche d’Art Visuel, Galerie Denise René, Paris. 1964, documenta 3, Kassel. 1965, The Responsive Eye, The Museum of Modern Art, New York. Lit. : GRAV, “Assez de mystifications!,” brochure, Paris, 1961, later published in: GRAV (ed. ), Participation. À la recherche d’un nouveau spectateur. Groupe de Recherche d’Art Visuel, exhib. cat., Museum am Ostwall, Dortmund, 1968, p. 6. GRAV, “Transformer l’actuelle situation de l’art plastique,” brochure, Paris, 1961, later published in: GRAV and Galerie Denise René (eds. ), Groupe de Recherche d’Art Visuel. Paris 1962, exhib. cat., Maison des Beaux-Arts, Paris, 1962. (1943, Zagreb, today HR) studied at the Faculty of Electrical Engineering and Computing, University of Zagreb, and product design at the Akademie für angewandte Kunst Wien, Vienna (grad. 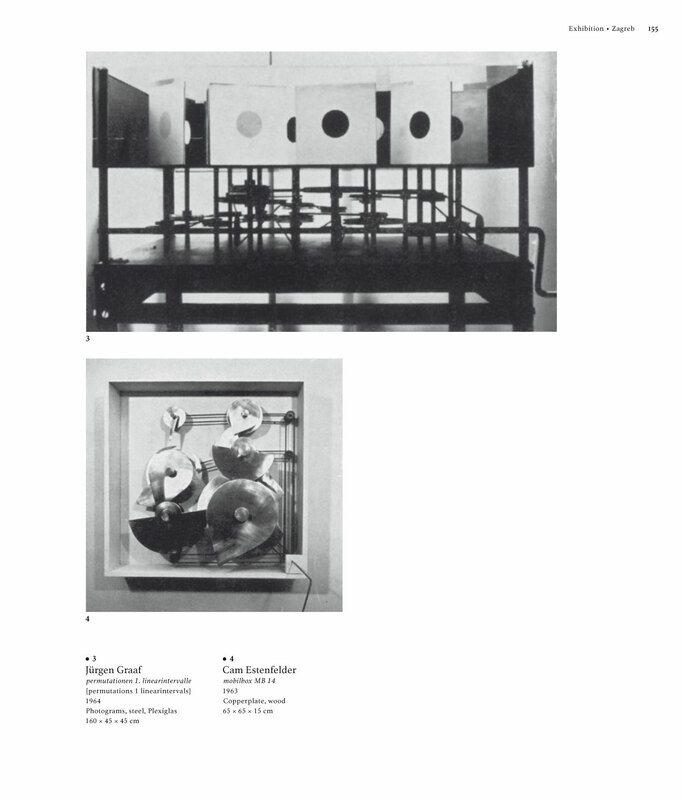 1968), followed by a specialization course at the Institute of Design, Akademie für angewandte Kunst Wien. After returning to Zagreb, he founded the studio Prodesign. 1975 moved to Montreal, 1977 to Winnipeg, and 1979 to Toronto. He lives in Toronto, CA. Exhib. : 1950–1970, ULUPUH, Zagreb. 1970, Zagreb Salon, Zagreb. 1970, Biennale of Industrial Design, Ljubljana. was founded in Buenos Aires, AR, in March 1969 by Jorge Glusberg, founding director of the Centro de Arte y Comunicación (CAYC), Buenos Aires, after contact with the work of the Computer Technique Group Japan. Founding members: Luis F. Benedit, Antonio Berni, Eduardo Mac Entyre, Osvaldo Romberg, and Miguel Ángel Vidal. Further members: Ernesto Deira, Humberto Demarco, Gregorio Dujovny, Mario Marino, Rogelio Polesello, as well as Isaías Nougués, Josefina Robirosa, and Norma Tamburini. The group existed until 1973. Exhib. : 1969, Grupo de Arte y Cibernética Buenos Aires y Computer Technique Group of Tokyo, Galería Bonino, Buenos Aires. 1970, Computer Graphics 70, Brunel University, Uxbridge. 1971, Grupo de Arte y Cibernética, Centro de Arte y Comunicación, Buenos Aires. Lit. : Jorge Glusberg, arte y cibernética. san francisco, londres, buenos aires, exhib. cat., Centro de Arte y Comunicación, Buenos Aires, 1971. 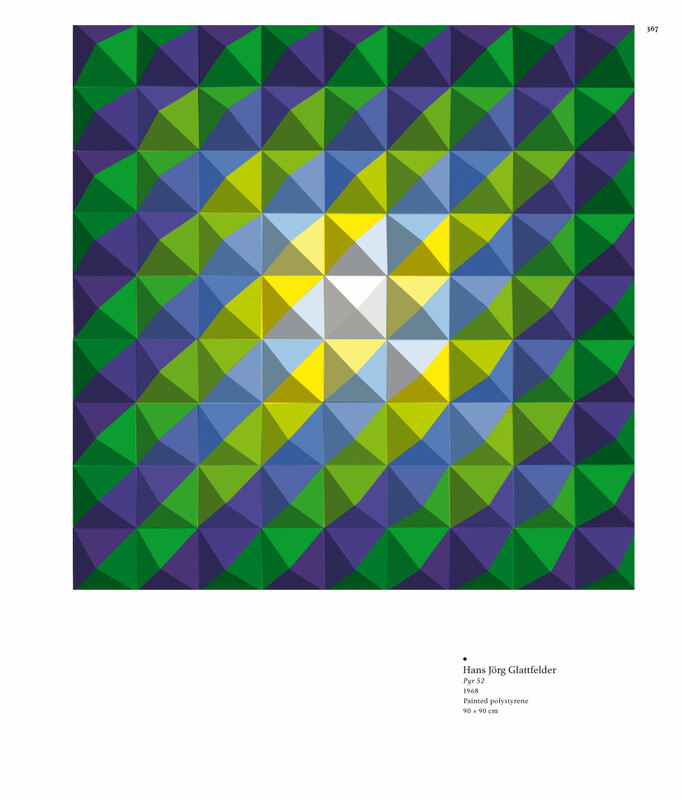 Jorge Glusberg, arte y computadors en latinoamérica / art and computera in latin america, exhib. cat., University of Minnesota, Minneapolis, MN, 1973. In 1959, Silvio Ceccato invited Pino Parini to join a research group on “machinery that observes and describes the events of its environment” at the Centro di Cibernetica e di Attività Linguistiche at the University of Milan. A number of artists joined Parini and formed a group in spring 1963. The group exhibited as Gruppo V as well as Gruppo di ricerca cibernetica in the mid-1960s. It presented itself in various constellations of members. Members were Vittorio d’ Augusta, Giorgio Benzi, Augusto Betti, Flavio Casadei, Gerardo F. Dasi, Eugenio Lombardini, Massimo Marra, Pino Parini, Galliano Ricci, Giorgio Scarpa, Giulio Tedioli, Giancarlo Valentini, Mario Valentini, Antonio Valmaggi, and Aldo Villani. Exhib. : 1964, Strutture di visione, Avezzano. 1966, Nuove ricerche visive in Italia, Galleria Milano, Milan. Lit. : Giulio Carlo Argan, Strutture di visione, Rome, 1964.
is a collective which was founded in Milan by Antonio Barrese, Alfonso Grassi, Gianfranco Laminarca, and Alberto Marangoni in 1964. The planning of works was done as a collective. Since 1966 member of Associazione per il Disegno Industriale (ADI) and shift of activities towards design. Alternative names MID Ricerche visive and MID Design were used after 1966. Barrese left the collective in 1972. From 1972 Grassi, Laminarca, and Marangoni collaborated as MID Design/Communicazione Visiva until 1992. Exhib. : 1964, Venice Biennale. 1965, MID Gruppo di ricerca, Galleria Il Centro, Naples. 1966, KunstLichtKunst, Stedelijk Van Abbemuseum, Eindhoven. was founded by Alberto Biasi, Edoardi Landi, and Manfredo Massironi in Padua in 1959. Toni Costa and Ennio Chiggio joined the group in 1960. The group’s gallery, Studio N, opened in Padua in November 1960. The group disbanded in 1964. Biasi, Landi, and Massironi continued to collaborate as Gruppo enne 65, which existed until 1966. Exhib. : 1960, Mostra chiusa. Nessuno è invitato a intervenire, Studio N, Padua. 1962, Anti-Peinture, Hessenhuis, Antwerp. 1964, Venice Biennale. Lit. : Enzo Mari, Gruppo N, and Gruppo T, “Arte e libertà – Impegno ideologica nelle correnti artistiche contemporanee,” in: il verri, 12, 1963, pp. 133–135. was founded in 1959 by Giovanni Anceschi, Davide Boriani, Gianni Colombo, and Gabriele Devecchi, based on the manifesto Miriorama 1. In 1960, Grazia Varisco joined the group. It existed until c. 1964. Exhib. : 1960, Miriorama 1, Galleria Pater, Milan. 1960, Miriorama 7, Galleria San Matteo, Genoa. 1961, Bewogen Beweging, Stedelijk Museum, Amsterdam. 1964, Venice Biennale.